In 1957, Count Giovanni Lurani proposed a new Junior Formula, as a training ground for race drivers, similar to the short-lived 1946 Cisitalia D-46 Monoposto class instigated by Piero Dusio in 1946. The old 500 cc Formula III had served this purpose, but was largely limited to Great Britain and now was in need of updating. Formula II, the next step, was being used as a development arena by Lotus, Cooper, Porsche and Ferrari and the grids were populated by Formula I drivers. Lurani’s proposal was quickly adopted by the FIA. The new formula would be based on a stock block and head configuration with proprietary 1100 cc engines. There was no doubt Lurani had in mind the Fiat 1100, but there were German, English and French engines which would also qualify. The Italians quickly made cars for the new formula, and the first race was held on January 1958 at Monza. Word spread quickly and by the second race many would be race manufacturers were jumping into the act. Most, like Stanguellini, Bandini and OSCA, were from the North, in the area of Modena, Forli and Bologna, but the enthusiasm for the new formula spread to the South, reaching Naples, where I lived. There were many race car fans in and around Naples, and one such enthusiast was Mr. Armando De Martino, who had the means to own a wonderful Alfa Romeo 1900 Sprint Touring-Superleggera. In 1958 I was 23 years old and my job was in the timber business (I was managing the Tropical Timber Sawmill of my family). In fact, I was planning to exhibit our kind of new tropical timber in a fair at Naples, scheduled for June when I met De Martino, who was also involved in the exhibition. Though I was not a qualified engineer, I had attended the Liceo Scientifico, and studied design principles, which I later put to good use in the design of radio controlled aircraft. Due to our common interests, we became good friends in a very short time. De Martino lived in the village of Vico Equense, a small town near Castellammare de Stabia, and also knew my cousins, Ciro & Gioacchino Ingenito. They, in turn, owned and operated a small factory, named Arredalsud, in Castellammare which manufactured school desks and chairs. This furniture was often made of tubing, so Ciro and Gioacchino were experts at welding various types and sizes of steel tubes. De Martino figured that in addition to driving, he’d provide the money and impetus, as well as the donor car. I would act as the chief engineer, while my cousins would actually build the new machine. I discussed this with my cousins and we accepted De Martino’s offer, but we thought of it rather more like a youthful folly than a serious effort. Maybe we would not compete with Ferrari, but we’d have fun all the same. While I busied myself with the concept and design, Ciro and Gioacchino made short work of De Martino’s old Fiat 1100. They pulled the engine, which was equipped with only one dual Weber and about 50 hp, pulled out the transmission and removed the front suspension and steering gear. Back at the drawing board, I was planning something a little different than the typical Formula Junior. It so happens that at the time I owned a Lancia Flaminia Coupe Pininfarina, with the very advanced transaxle and four wheel independent suspension. I much admired this, and decided to make it a feature of our new race car. We found a Fiat 600 transaxle, turned it around and placed it at the end of the Fiat 1100 transmission shaft. We used the stock rear suspension from the 600. 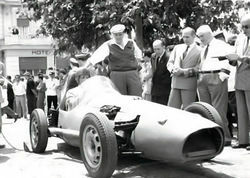 Paolo Samonà, first owner of the 1959 Autosud F. Junior, chassis 0011. 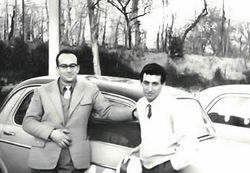 Paolo is on right together with Pippo Cavallaro, a wizard in preparing Fiat and Alfa engines. The car is the Fiat 1100 TV, tuned-up from Cavallaro for the Agnano-Cappella dei Cangiani hillclimb (near Naples, now mid town!) in 1959. Paolo won the 1100cc touring class with Fiat. The chassis was made with 4 pipes of medium diameter in a rectangular section and then joined with pipes of smaller diameters for a rigid, if somewhat heavy space frame. The 1100 front suspension was welded to front supports and the engine and transmission placed carefully into the new chassis. Many details were decided and changes made on the spot as we all worked out the complexities of independent suspension. Youthful enthusiasm does wonders, and suddenly, our race car was ready for a body. We found a coachbuilder in Naples, but he was not very skilled at his craft. But, we were all learning. The construction of car was not so fine, but all parts works well and chassis was strong enough. At the rear, the 600 axle, bearing support, coil over shock and control arm can be seen. Quicker than we had imagined, the Autosud Junior Model ’58, chassis 0010, built expressly for Armando De Martino, was now ready for action. The name Autosud Napoli was chosen by Ciro like “Auto of Arredalsud”. The design of the pelican in the badge was taken from a metal paper weight on his desk. We had no idea where this path would take us, or that we would create two more, versions of the AutoSud Formula Junior. Around the corner would be detours into the wonderful world of kart racing, which ironically, turned out to be the real training class for future Formula One drivers. The 1958 Autosud Formula Junior chassis 0010 was ready in few months and our sponsor, Armando De Martino competed in a few hillclimb events around Naples. But the car needed development, and De Martino was a beginner race driver, so the results were not remarkable. However, the Autosud perked the interest of two of my “gentleman driver” friends, a Sicilian nobleman by the name of Paolo Samonà and Ronald Boccoli. They asked me if I would produce two more Formula Juniors, but updated and more competitive than the first. After long talk with Ciro & Gioacchino we said yes and started to work. 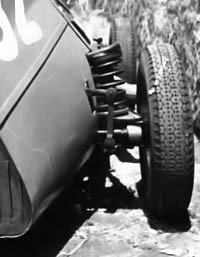 The rear axle of the first Autosud used Fiat 600 parts, with one central arm, coaxial shocks and coil springs. That solution was better than rigid axle, but for 1959 I designed my own suspension with 2 unequal length wishbones and adjustable camber on the upper wishbone, This was quite advanced for the day. The design took me more than 3 months because of many details to study and design. For the chassis, I decide to use a section like an inverted trapezium with tubes of smaller diameter than the 1958 version. At the rear, we decided to make use of a Fiat 600 gearbox, and therefore the 1100 transmission as bolted to the rear of the 1100 engine was used only as a prop shaft and engine support. This idea, coupled with the now-fully independent rear suspension, provided better weight distribution and a far superior rear end. What we did not know yet, however, was whether or not the 600 transmission could take the power and torque of well-tuned 80 hp Fiat 1100! I must confess, we were not accomplished engineers and there were many things which should have been done differently. 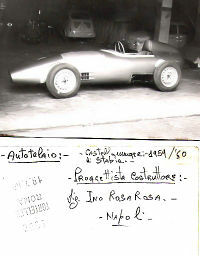 The note under the photo was written personally by Paolo Samonà, and gave the name of the designer as "Ino" Rosa Rosa. Ino is the diminutive of Gioacchino. This photo of 0012 was taken at the shop of the coachbuilder. Looking back, we never considered a rear engine car when designing the '59 Juniors. At the time, even Lotus was still running a front engined F2 car, and Cooper was the only rear engine contender. The transaxle system was than considered as the overall best solution. Also the great Enzo Ferrari was saying at that time that the horse must stay in front and not back. Now we know that he was wrong, but at that time he was insisting on front engine cars. So who were we to question this? But in retrospect, I wonder if we could have really made a difference had our 'clean slate' included simply placing the engine at the rear! Things might have been very different! This time the body was made in Rome by a skilled and enthusiastic coachbuilder. We were very proud of the final result, and sure that car could be very very competitive due the innovative features given to them. The weight was over the minimum of 400 kgs, but many parts were lightened and the engine, tuned in Naples, could give more than 65/70 hp. We started chassis construction in summer 1959 and both cars were ready in end of winter 1960. That one year made all the difference in who would rule Formula Junior. Paolo Samonà with Autosud ’59 0011 made a few competition appearances in hill climbing and one at a circuit, the Vallelunga Caltex Grand Prix 1961. (reported with wrong name of “Somona” on Autosud). We completed 0012 for Boccoli, but it was never raced, as far as I know. Once the cars were in the hands of the new owners, we could not do much more, even though we knew that the cars needed testing and more development. We soon forgot about the Formula Junior cars, and Ciro & Giocchino was in the meantime fully engaged in producing and racing karts for competition in 125 cc class with gear box. We started with an Innocenti-Lambretta (old competitor of Piaggio-Vespa) engine, then used a Rumi, two cylinder engine and finally we started to use the nice Spanish Bultaco. Our kart chassis was strongly innovative and particularly suitable and stable for road circuits. We dominated the races in central-south Italy until 1963. In May 1962, Enzo Rippa won a competition at Vallelunga with an average record speed over 100 kmh and I acheived appreciation and compliments from the great Piero Taruffi, top Formula 1 driver, clever engineer and record man. Also in May of 1962, our friend Armando De Martino, who still owned chassis 0010, died tragically in a car accident. The family put the car in a garage in Sorrento and it was later dismantled. After I delivered the two 1959 Autosud Formula Juniors (0011 & 0012) to first owners, Mr Paolo Samonà (0011) and Mr Ronald Boccoli (0012) I was given to understand that both men were distracted from car racing by personal matters, and I assumed they had abandoned cars somewere. Life went on, and for over forty years I virtually forgot about the Autosud episode: To design karts and cars was not my job, but only a hobby. My job was in the timber business. Last year I decided to write the story of my hobbies for my two grand-daughters. While doing that I discovered on the Internet that the 0012 (ex Boccoli) was still alive in England and owned by Ian Robinson. I also found that 0012 was tested for VeloceToday in comparison with a Stanguellini and OSCA getting some nice comments from the author, Ed McDonough. I was astonished, confused, excited and proud at same time. To get the recognition of good job after 47 years is a strong sensation and satisfaction, believe me. My only regret that Ciro & Gioacchino cannot join my happiness as both died some years ago. I had recently talked with Samonà and Boccoli, both living now in Rome, and got confirmation that they both sold cars to merchants some years later. After discovering 0012 on the Internet, I started an effort to find the sister 0011. I have to thank Duncan Rabagliati of Formula Junior Historic Racing Association and Delio Galassi if I succeed in tracing the car to Bologna. There we found 0011 in the hands of Mario Caliceti, a strong driver for hill climbing races with an Osella/BMW 3000 and owner of precious collection of cars produced before 1960. The Autosud is perfectly conserved and fully operational, just like we delivered it so many years ago. Mario loves it and will use it when he retires from competition with actual cars. He refused to sell his cars despite many request received from all over the world. I met Mario last April and enjoyed his friendliness and seeing again my work after so many years.